To protect the straw bale walls on this studio from direct exposure to precipitation, the roof was built with large overhangs. This will also provide covered porch space around the perimeter of the studio for the owner to enjoy during inclement weather. 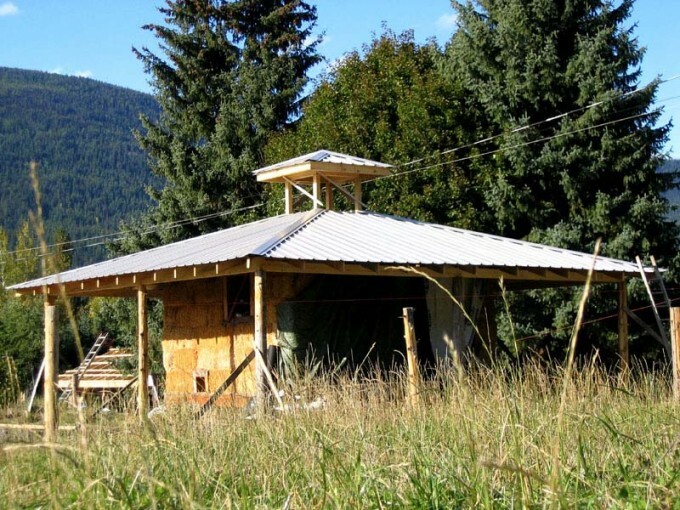 The studio has a small footprint – only 169 square feet to the outside of the straw bale walls. Without any of the long rectangular spans inherent in a larger building, installing the sheet metal roofing involved a lot of angle cutting to fit the hip roof framing and cupola, and this took more time to finish. Despite the higher labour costs, the owner was very happy with the result, and she is excited to plaster the bales and start using the building.